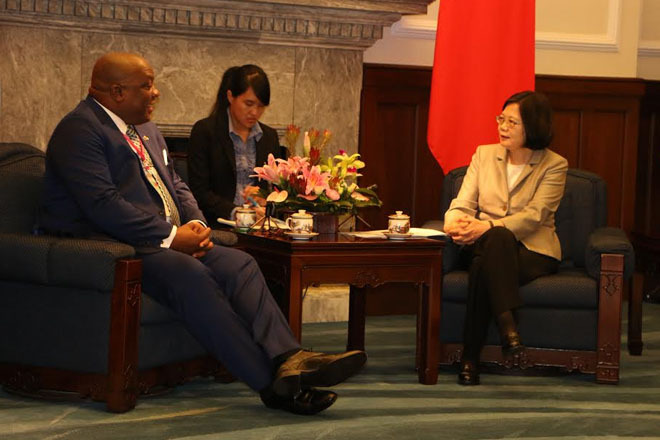 (SKNIS) — Prime Minister of St. Kitts and Nevis, Dr. the Honourable Timothy Harris, thanked the new President of the Republic of China (Taiwan) Her Excellency Dr. Tsai Ing-Wen, who was inaugurated as the first female president on May 20, for her Government’s invitation to visit her country totally at its courtesy and expense. In a courtesy call paid on President Tsai on May 21, a day after the president’s momentous inauguration ceremony, Prime Minister Harris, along with his delegation, was invited to visit the Presidential Office in Taipei to meet with Dr. Tsai. The meeting was extremely cordial, with Prime Minister Harris extending congratulations to President Tsai on behalf of himself and the Government and people of St. Kitts and Nevis. President Tsai was rather pleased and said that she had noted the long-standing relationship between the two countries and was delighted that the delegation from St. Kitts and Nevis had come to Taiwan to witness her assumption as the 14th president. The two leaders touched on several issues pertinent to their country’s development including judicial reform, tourism, and representation in international bodies. President Tsai thanked St. Kitts and Nevis for its help and support in advocating for its participation in international organizations. She said that she was cognizant that tourism in St. Kitts and Nevis “has been expanding at a very fast pace.” She indicated that there was need for judicial reform in Taiwan because its judicial system, which is a combination of German, Japanese, Chinese and American elements, needs to be user-friendlier. She pledged her country’s continued support to work with the Government and people of St. Kitts. “I would like to reaffirm our commitment to work with you in whatever way we can. Let’s put it this way, we will do whatever we can so that you can advance your socio-economic development,” said the president, 59, who holds a doctoral degree in law from the London School of Economics and Political Science where she specialized in international political economy and the redistribution issues caused by globalization and changes in the structure of the global economy. Prime Minister Harris also pledged his government’s unflagging support for the Government and people of Taiwan and thanked the country for its willingness to cooperate with St. Kitts and Nevis on a number of fronts. “I want to thank you and certainly I am looking forward to consolidating our friendship. It is interesting that Taiwan was the first country with which we established formal ties. Since that time, the relationship has grown. We have remained a consistent and reliable friend of Taiwan, advocating on its behalf in relation to its own nationalistic expectations, as we understand them. We stand ready to use our membership in those international organizations to promote the just cause of the Government and people of Taiwan, and so you can count on us as the most reliable of allies and so we would want to continue on that path,” said Dr. Harris, while thanking the president for Taiwan’s support in a wide range of areas including agriculture and education. “We have relied on our close friendship with your government and others to assist us in the difficult path of development,” Prime Minister Harris said, while pointing to shared values such as a vibrant democracy. Prime Minister Harris also told President Tsai that she had ascended as a woman to top leadership in the country against all odds and that with her inaugural speech she was off to batting well. Premier of Nevis, the Honourable Vance Amory, also commended President Tsai and thanked her for Taiwan’s cooperation in many areas with the Federation, of which Nevis has been a beneficiary. St. Kitts and Nevis established diplomatic ties with the Republic of China (Taiwan) in 1983.